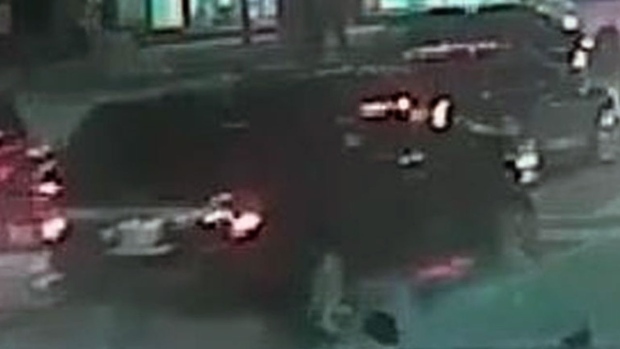 A suspect vehicle in a downtown hit-and-run on April 14, 2019 is seen in this surveillance camera image released by Toronto police. A 21-year-old man sustained life-threatening injuries after he was struck by a vehicle while waiting at a bus shelter at a busy downtown intersection overnight Sunday. Police said the victim was standing at the intersection of College Street and Spadina Avenue at a TTC streetcar stop, which has a glass shelter on a median between the passing and curb lanes, at around 1:50 a.m.
A black SUV, which was driving westbound on College Street in the passing lane, reportedly mounted the curb and struck the victim, according to officers. 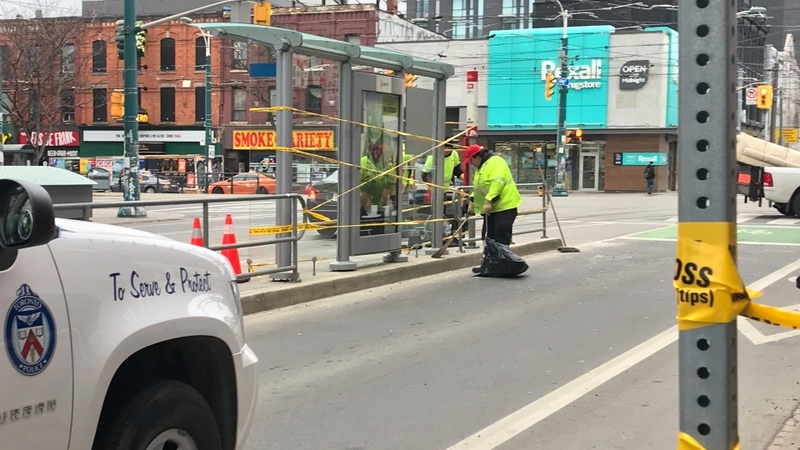 “The driver of the suspect vehicle passed at least three motor vehicles that were stopped in the passing lane of westbound College Street at Spadina Avenue, between the stopped vehicles and the TTC streetcar stop,” police said in a news release issued on Sunday evening. The male victim was taken from the scene of the collision to a hospital to be treated for his serious injuries. Investigators said the driver of the vehicle involved in the crash fled the scene. When police arrived at the scene of the collision they said they located a part from the vehicle, described as a side view mirror. “Upon further investigation, investigators have determined that the part belongs to a Ford Expedition, 2015 to 2017 model, or a Lincoln Navigators, 2007 to 2017 model,” investigators said. An image of a suspect vehicle, obtained by surveillance camera footage, has been released by police. “Police are asking local residents, businesses and drivers, who may have security or dash camera footage of the area or incident, to contact investigators,” officers said. Anyone with further information is asked to contact police at 416-808-1900 or Crime Stoppers anonymously at 416-222-TIPS (8477).